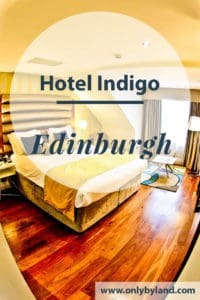 Hotel Indigo Edinburgh, York Place is a hotel you should consider if you want a true Scottish experience whilst visiting the capital. For the latest special offers and events check out the Hotel Indigo Edinburgh website, Twitter, Facebook or Instagram pages. The hotel is located in Georgian style townhouses in the new town of Edinburgh. You may have seen houses like these on TV or in the movies. 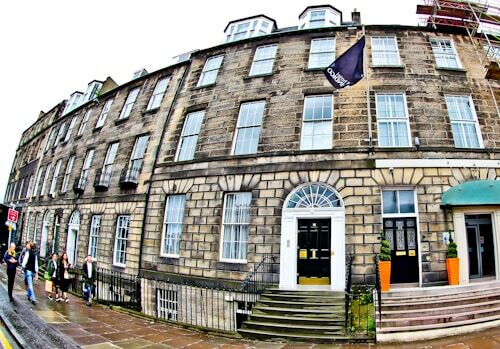 At Hotel Indigo Edinburgh, York Place you’ll get the experience of staying in one. The new town of Edinburgh is a UNESCO world heritage site which means you will be staying in a UNESCO site. Edinburgh is famous for J K Rowling as she wrote the Harry Potter stories in an Edinburgh cafe. Another author from Edinburgh, Arthur Conan Doyle who wrote Sherlock Holmes was actually born on the same street as the hotel. At the check in desk you’ll receive a warm welcome. You should ask the staff for recommendations on what to see in Edinburgh. I was given a map and the receptionist recommended a route which passed by many points of interest of the city. You should pay attention to the pictures in reception and around the hotel. In reception you’ll see pictures of the Nelson and Scott monuments. If I hadn’t seen these pictures I could have missed these two points of interest as I didn’t know they existed. Every one of the hotels 60 rooms is unique and Scottish themed. In my room notice the artwork of the National Monument of Scotland behind the TV. This is another point of interest I didn’t know existed before visiting Edinburgh. From the room you can see the very impressive St Paul’s & St George’s Church which would be a major point of interest in a smaller town. Each room has a media center which is perfect for those visiting on business. WiFi is free, super fast and reliable. For those visiting with kids you can use the media center with a games console. The mini bar in the hotel is free and refilled daily. 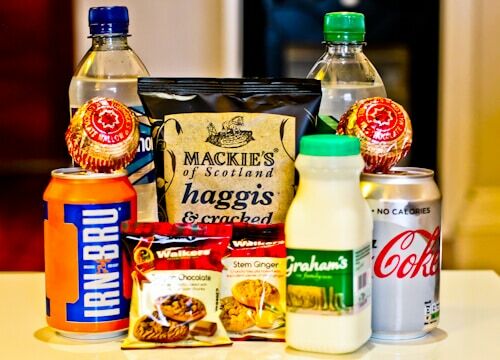 As you’re in Scotland you should try the local Scottish treats and the mini bar is full of them. It’s unlikely you’ve tried haggis flavor potato chips before! You’ve probably tried shortbread but I’m sure they taste better in Scotland. Irn-Bru is a Scottish soda with a unique flavor. The Tunnocks Tea Cakes are marshmallow in chocolate on a biscuit base and go very well with the milk. The water is fresh from the Highlands of Scotland. There is also tea, coffee and hot chocolate available in the free mini bar. The showers in the bathroom are rain fall showers, you have the option of a regular shower head as well. Toiletries include a very generous amount of Aveda products. Towel heaters and bathrobes are very useful especially if you’re staying during an Edinburgh winter! If you are eating a lot of fresh haggis during your trip to Edinburgh then you may want to visit the gym. Fresh haggis is full of protein which will make your visit to the gym more beneficial. 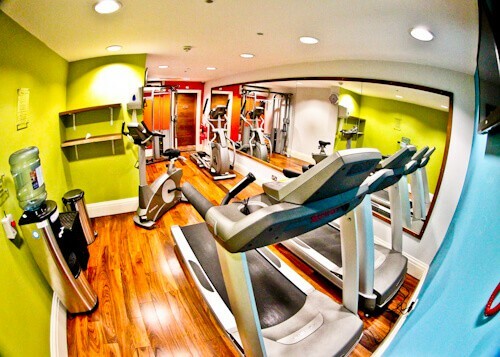 The gym is open 24 hours and features 2 running machines, a cross trainer, a multi-use cable weights machine and some light dumbbells. You have the choice of several different breakfasts at the hotel. Whilst in Scotland you should try the traditional Scottish breakfast at least once. 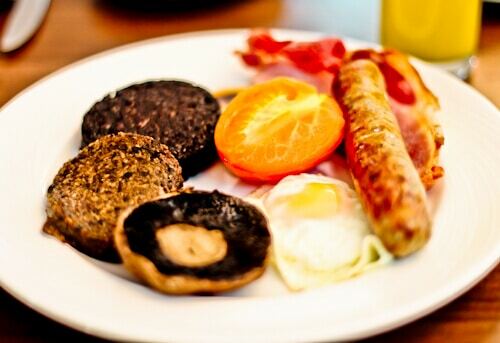 The Scottish breakfast consists of a couple of foods you’ve probably never tried, haggis and black pudding. Other breakfast options are Scottish smoked salmon, homemade pancakes or porridge. Also be sure to check the specials board before ordering. 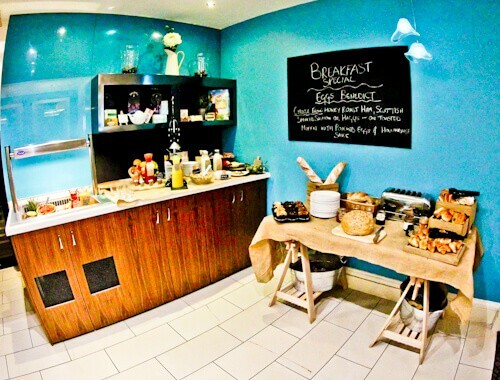 Hotel Indigo is a vegan friendly hotel and offers a veggie breakfast option which includes veggie haggis. As well as the breakfast dish option, you also get access to the breakfast buffet. The buffet includes a selection of fresh breads, sweet breads, muffins, juices and toppings. Don’t feel guilty about eating a huge breakfast, you’ll need the energy to explore the sites of Edinburgh, maybe to climb Arthur’s Seat! Scotland is the home of whisky and the bar has a selection of Scotch whiskies sourced from local distilleries. They also serve Scottish gins, cocktails and craft beers. 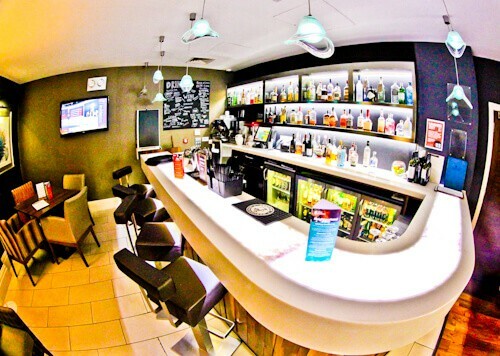 Be sure to check out the Hotel Indigo Facebook page to check if there are any events scheduled for the bar during your stay. 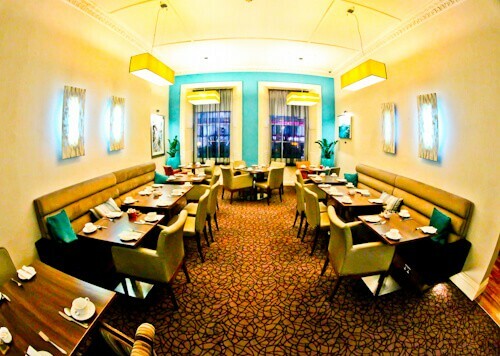 The restaurant at Hotel Indigo Edinburgh is known as the Turquoise Thistle. This is where you’ll enjoy your buffet breakfast. The restaurant stays open until 11 pm and offers a Scottish menu throughout the day. Foodies visiting Edinburgh don’t have to leave the hotel to enjoy many of local dishes they came to try. For the latest special offers and events check out the Hotel Indigo Edinburgh website, Twitter, Facebook or Instagram pages. 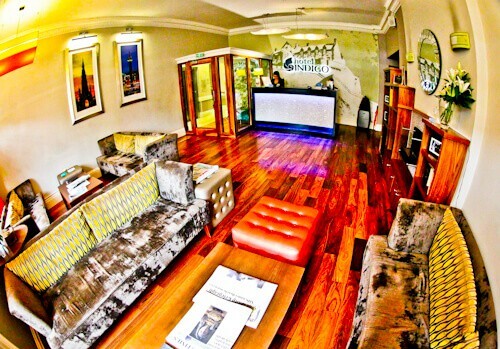 Enjoy your stay at the Hotel Indigo Edinburgh, York Place. Check out the Hotel Indigo in York, the home of chocolate. I just love everything about this hotel! What great atmosphere/ambiance your photos show. The Scottish theming in the decor and the food really would make for the total experience. The hotel looks really well cared for, so clean and inviting. All of this in addition to the location makes it a real winner in my books. First off, I love the facade of the hotel because it looks like an old medieval structure. And yet, the inside of it is such a huge contrast. It looks so modern and cozy! The food looks great too! Looks like a great place to stay! The exterior is beautiful, and that breakfast looks delicious. I’m dying to visit Edinburgh (and Scotland in general)–I’ll have to remember this place! I am on a quest now to find haggis potato chips. I wonder if the Scottish House at Balboa Park in San Diego can find them for me. We always go there for their Christmas spread. Scottish food is sometimes boohooed but they really do make some amazing dishes. I haven’t been in Edinburgh for over thirty years…. It sounds like it’s time for me to return. Edinburgh sounds fun to visit and Hotel Indigo seems to be a must vist. I love the decore and OMG, the bathroom is one of a luxury. Talking of getting stacked on with protein, there is a gym. I like that the hotel promotes healthy living in a way. This hotel in Edinburgh is a real luxury. As it is styled like Georgian townhouses, this is on my wishlist. 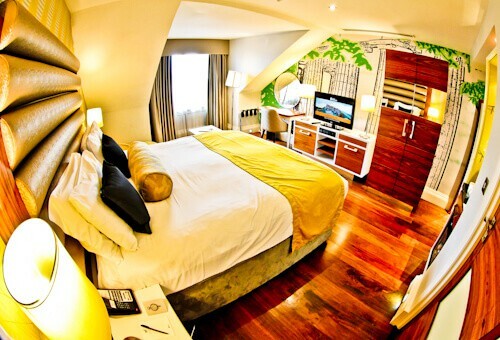 Beds look comfortable and a nice wooden interiors of the room. Bathroom is chic and free mini bar are you joking? Really many hotels provide free bottled water or beer but free mini bar full of my favorite snacks is really like a cherry on the cake. This hotel has won me. Hotel Indigo looks so charming, and very colourful too. I think I’d like to take a games console to my room and I have no children! The haggis is definitely an acquired taste, and I’ve tried it, so would settle for a nice Scottish breakfast without it instead! I like those Scottish touches of the Irn Bru and teacakes in the room; they sound yummy! Looks beautiful! 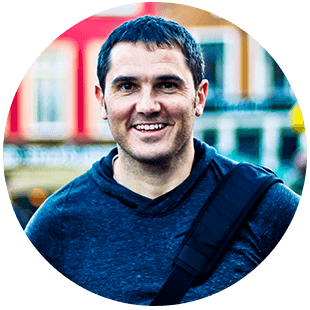 I absolutely love Edinburgh perhaps my favorite city in the U.K. And… always important to have a gym when you’ll be eating the heavy but delicious UK fare! Looks like a really nice place to stay and looks pretty central too. I have never been to Edinburgh, even though it has been on the list a few times! With your photos, the places looks like a lot bigger. I also like how the colors are enhanced. By the way, it seems like a great hotel to consider when traveling to Edinburgh. This is just awesome. 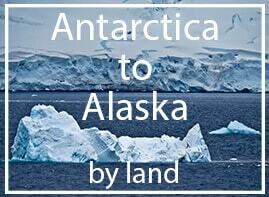 A hotel located in a UNESCO town which has free minibar and a veggie friendly breakfast buffet? I’m sold already… Is the breakfast complimentary? I agree you need energy for Arthur’s seat. We packed a small picnic to eat atop there! What a faboulous recommendation ! Now I am glad I haven’t visit Edinburgh before so I can stay in this beautiful and stylish hotel in the future ! I had no idea that were Harry Potter bookes were written ! That makes me wanna visit Scotland even more now! I’ve passed by the Scotch Whisky Experience many times taking friends around Edinburgh. It’s good to know that I can recommend it to folks who want to stay in my city. The hotel Indigo seems like a really interesting place to stay. I like the fact you can eat local Scottish food in the hotel and don’t have to go out searching. The breakfast photo made my mouth water! Indigo Edinburgh seems like such a nice place to stay. I’ve always wanted to visit Edinburgh, definitely know where I’m staying now when I get there now! Looks like a really nice place to stay. The rooms look cozy and the mini bar is really loaded! 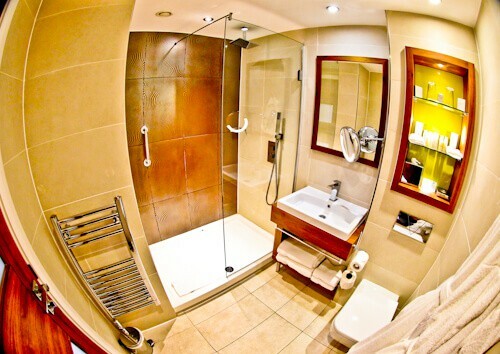 The bathroom also looks quiet clean and specious. I would love to explore this hotel when I go to Edinburgh. That looks like a great place to stay, great facilities and that breakfast looks delicious! I love the central location and the fact that they offer a free mini bar, that’s actually quite nice of them! If there’s only one reason I’d choose this hotel, it’d be the free mini bar. But no, really, that Georgian style townhouse is so lovely! 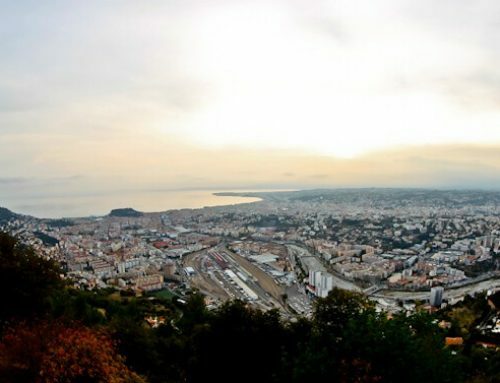 And I love that it’s in the middle of a UNESCO heritage site. This hotel is on top of my list when I visit Edinburgh! I love a good Scottish breakfast. This looks like a really cool place to stay! If I didn’t live so close to Edinburgh I would want to stay here for sure!